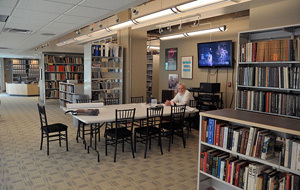 The Allesee Dance and Opera Resource Library is the official library and archive for Michigan Opera Theatre, and specializes in research materials specific to dance, opera, and MOT's forty year history. Founded in 2007 with a generous gift from Robert and Maggie Allesee, MOT is currently continuing to open its resources to the public, including books, scores, CDs, videos, and hundreds of unique items from the history of MOT productions. From performance reviews, to photographs, to an immense recording collection, MOT is proud to offer this unique resource online. 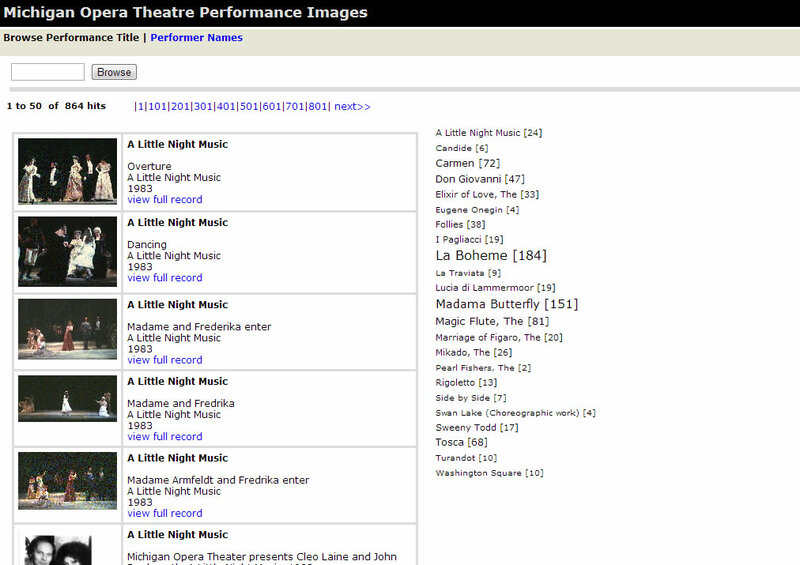 As part of an Institute of Library and Museum Services Grant titled, "Educating the 21st Century Fine and Performing Arts Librarian," MOT interns have developed a unique online archival catalog that makes available the entire MOT archive - as well as searchable database of all performances. With assistance from the Wayne State University School of Library and Information Science, the library is currently cataloging and digitizing the MOT archives, both helping to preserve the history of dance and opera in Michigan, and provide experience to the next generation of information professionals. This library has three different types of databases available, the library catalog, scanned archival items, and our performance history. The performance images collection contains imagery from the MOT performance history. This is hosted in partnership with the Wayne State University Libraries. The library catalog contains all commercial items, including dance and opera books, dance videos, cd's, LP's, and librettos. Our performance search contains all MOT performances, including opera and dance events, and has names of all of the performers. A collection of every program book for all performances, ranging from 1962 to the present season. Photography of performances from the 2005-2006 Season are available online via the DOH Archives Web site, available at http://www.doharchives.org. This photo archive was created and graciously maintained by MOT Photographer John Grigaitis. The Michigan eLibrary (MeL) has full text versions of Opera News and Dance Magazine available for all Michigan residents, along with other related titlesl. While MOT holds extensive print collections of Opera News and Dance Magazine, the full database is available online. A complete chronological listing of all Michigan Opera Theatre Opera and Dance performances complied by Tim Lentz, Ph.D., MOTs Archivist and Director of the Allesee Dance and Opera Resource Library at the Detroit Opera House. David DiChiera, Karen V. DiChiera and Mark Vondrak for their contribution. The library is built with help of the various interns, volunteers, and institutions to support the MOT. Read more about the various people who work together to help make our materials available online.